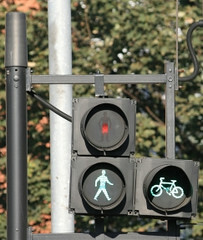 Tell Congress: Make walking and biking safe! In the last 15 years, 76,000 Americans have been killed while walking or crossing a street – too many of our roads are built for cars only. But thousands of people are stepping up to make biking and walking safe. Rep. Earl Blumenauer introduced a piece of legislation that could set aside $2 billion for grants to fund safe networks for biking and walking in communities all across the country. And Secretary Ray LaHood just joined the fight by issuing a directive that makes safe walking and biking a priority for the U.S. Department of Transportation! Please co-sponsor H.R. 4722, the "Active Community Transportation Act of 2010," recently introduced in the U.S. House of Representatives by Rep. Earl Blumenauer. Making it safer for Americans to walk and bike will save lives -- more than 76,000 Americans have been killed walking in the last 15 years. Making walking and biking a more attractive option saves us time and money as individuals, as communities, and as a nation. Americans across the country are seeking more opportunities to travel by foot or bike. A quarter of all trips taken in the United States are within a 20-minute walk -- if we can make it possible for more people to walk or bike, there will be fewer cars on the road, lower emissions, more calories burned. Nationally, we could save tens of billions of dollars -- every year -- by investing in more walking and bicycling. H.R. 4722 would enable communities to compete on merit for targeted funds to complete active transportation networks to enable Americans to walk or bike safely and conveniently. With the high costs of driving, mounting congestion, an obesity epidemic, oil dependence and environmental concerns, we need to have the healthy and affordable choice to travel by foot or bicycle for the shorter trips that dominate our daily routines. For more information on H.R. 4722, please contact Legislative Assistant Tyler Frisbee in Rep. Earl Blumenauer's office. Please support this critically important and forward-thinking legislation. We will add your signature from the information you provide.